Update 2:15PM Thursday – Expected rain totals dropping. Rain/Showers to end by Friday Noon. Update 9:20AM Thursday – Expected rain totals dropping. Rain/Showers to end by Friday Noon. The latest models are out this morning. The prediction for rain through today remains the same as last night. 20-60mm in the Valley. The accumulation through to Saturday morning has decreased substantially. Now it is less than 10mm. So we have gone down from a total accumulation over 48 hours from a maximum of 90mm to a maximum of 70mm and likely less than 50mm. It is still expected to rain all day Thursday though with the strongest rainfall occurring before noon and we should see the back end of the front move away by 12PM Friday. Saturday is looking quite dry. The rain is here and it is building. Tweet or Facebook or Comment me your reports from around town. You’ll see my latest tweets, or retweets of others following the storm, on the sidebar of the page here. We’ll see how this goes this morning. The storm is basically on track and on time. We can take it! Stay safe out there! The Special Weather Statement has now ended, we will see if they issue any warnings for us. Wind warnings for West and East coast continue and a rainfall warning is in effect for Metro Vancouver. The evening model run is out so I will post this now rather than in the morning. 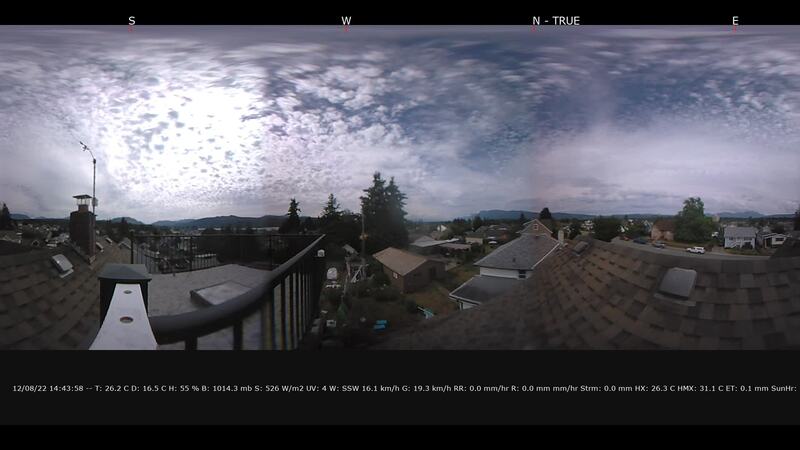 Compare the image below to the one from this morning. Here are the two predictions 4hrs apart, for 24hr rainfall, 4-4AM Thurs/Friday. Latest on Top. I would say the forecast has backed off just slightly. Our Valley now has some green as well as pink rather than full pink bordering black. The strongest 1hr bit of rain looks to be 8-9AM. But it will rain hard from 8AM through the noon hour. 7-10AM will also be the period of strongest winds. Environment Canada has continued a special weather statement for the rain coming on Thursday morning. Wind warnings have been issued for the regions where the special weather statement has been ended. 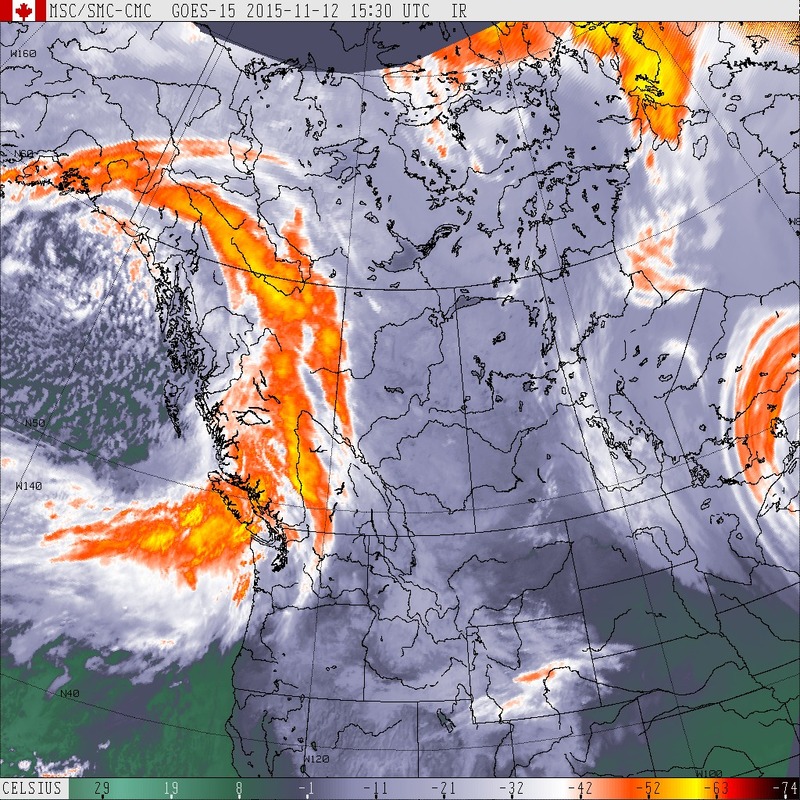 A powerful low pressure system in the Gulf of Alaska will send an intense cold front barrelling toward the BC coast tonight. This rapidly moving storm will provide a few hours of increasingly strong southeast winds as it approaches, followed by a wind shift and a few hours of rapidly diminishing westerly winds after it passes. The strongest winds will occur after midnight on the North and Central Coasts including Haida Gwaii, Prince Rupert and Bella Bella. On the South Coast including Vancouver, Victoria, and Nanaimo, the strongest winds will occur Thursday morning. Very heavy rain will accompany this system with total rainfalls between 50 and 100 millimetres likely. Rain from the storm may linger over Metro Vancouver and the Fraser Valley Friday, boosting rainfall totals above 100 millimetres. Wind warnings have already been issued for West and East Vancouver Island. Strong winds that may cause damage are expected or occurring. A storm will approach the north coast tonight. The associated cold front will sweep across Vancouver Island on Thursday producing very strong winds. 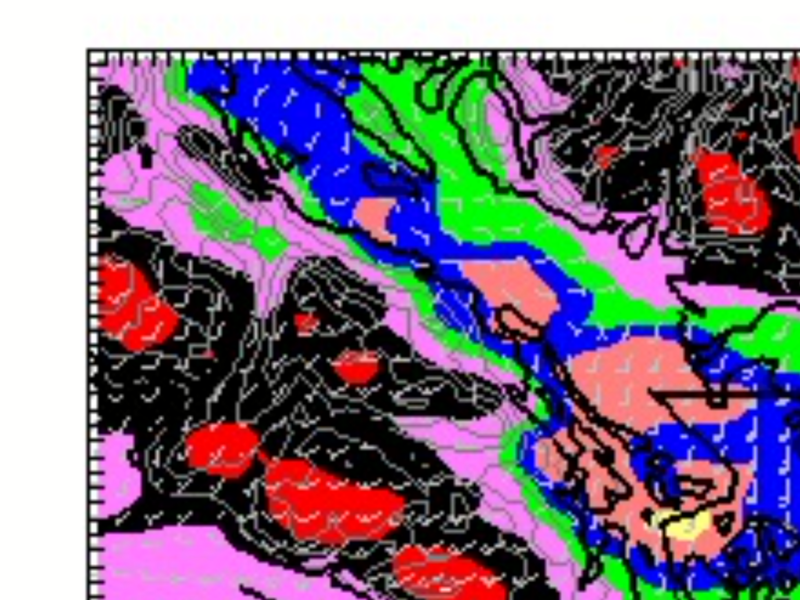 Southerly winds will increase to 60 to 90 km/h over West Vancouver Island early Thursday morning. The winds will ease slightly and shift to the southwest later in the morning in the wake of the front. I do not expect a wind warning to be issued for our area, however that does not mean we will not get strong winds. So batten down the hatches accordingly. Our main concern will be rain. 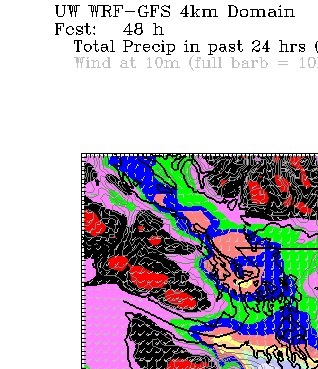 The model currently predicts as much as 60mm falling between 4AM Thursday and 4AM Friday. Here is a closeup of our region. The Valley appears to be in the pink, 2.56in/60mm area, but the immediate surrounding areas are solidly black, which is double that, up to 5in or 120mm. So I would say the model is leaving the possibility open that we could have over 60mm, especially if you are near the mountains. Parts of the watershed will certainly be getting the higher amount which means plenty of water in local creeks and rivers so beware. As the EC Warning states, the strongest winds will come mid-morning Thursday. Here is a look at the outer coast for betwen 7-10AM with winds up to 60knots (blue) or 110kph. Those winds will shift to the other side of the Island and Vancouver before 1PM. This will likely cause ferry delays. Another 30mm of rain will fall between Friday and Saturday morning. 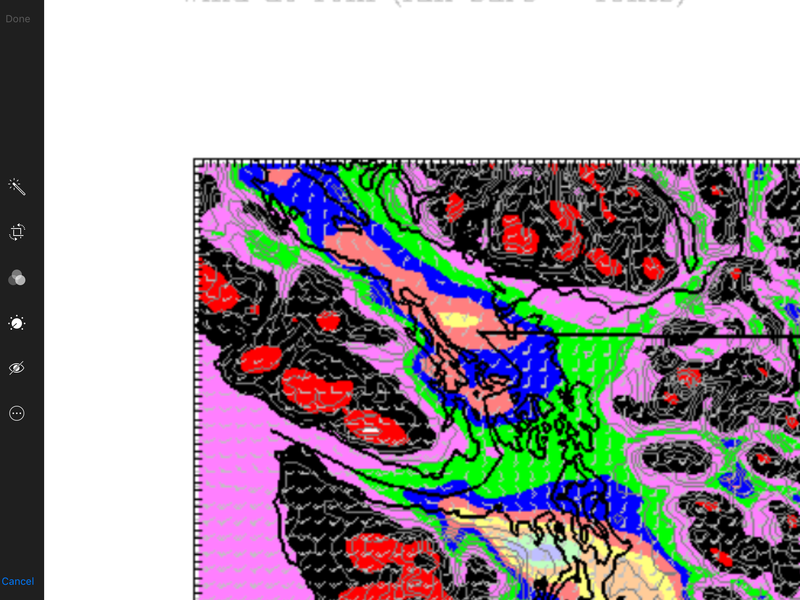 I will update this post if Environment Canada issues any warnings for Inland Vancouver Island or the morning models change the outlook significantly. Clear your street drains and take in any lose stuff. Gonna be fun…. Have a good Remembrance Day. Lest we Forget. See you at the ceremony at Glenwood at 10AM. Previous Rain coming Tuesday Afternoon then again Thursday. Next DOUBLE CONTEST!! FIRST SNOW AND HITTING 1000 FACEBOOK LIKES!